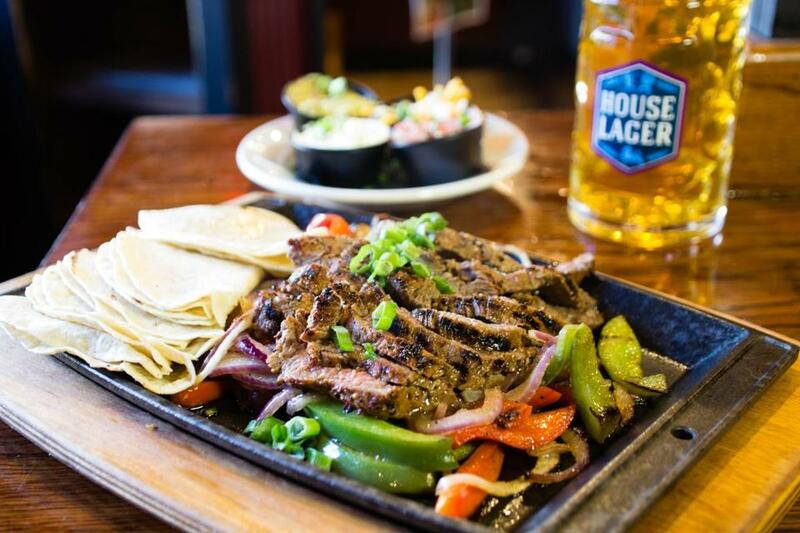 Get two-for-one fajitas at Olde Magoun’s Saloon on Saturday. Martini-guzzling colleagues who blithely split the bill. Pals who linger over coffee while you mentally calculate the baby sitter’s hours. The relative who comes to town expecting to be wined and dined, and never reaches for the check. When the restaurant tab hits the table, spending habits swing sharply into focus. In a recent Reuters/Ipsos opinion poll of more than 4,200 US adults, one-third of respondents said they were eating out less often than three months ago. Of those diners, 62 percent said cost was the primary reason. A 2016 Zagat survey found that the country’s least frequent diners live in Boston. (Models of restraint, we dine out on average 3.8 times per week.) As the Globe reported in September 2017, menu prices in the state have risen 2.5 percent on average over a 20-month period, though the cost of groceries has dropped 4.5 percent. In a pricey area, sometimes it’s easier just to cook at home. But what to do if you’re social but strapped? You might feel even worse if you just received a tax bill. Socializing with people in similar straits lessens the sting. Dining out reinforces some friendships — and makes others fray. “There’s so much emotionally invested in money,” says Janet L. Parnes, an etiquette expert based in Millis. Restaurant spending is one of the few financial transactions done in public. We don’t take friends along to buy a car or apply for a mortgage. But dining out is typically a group endeavor — and your level of spending reflects your values and your budget. But Parnes says that modern manners emphasize honesty. In fact, frankness with your dining companions can be perceived as an honor. If you’re with close friends, be straightforward about what you can afford. In a larger group where it might be uncomfortable to talk money, it’s OK to set broader ground rules ahead of time, Parnes says. “It makes the whole situation more comfortable for everyone. Say, ‘Want to do separate checks? It will make the math easier,’ ” she suggests. Of course, it’s easier if you’re all in the same boat. “A lot of [my friends] are employed but have crippling student loan debt. It’s kind of across the board. I’m not sitting at home missing out; we all are. We’re trying to pay off our debt. We had fun when we were younger,” says Salem’s Rachel Peritore, who budgets $200 per month for fun money (but who recently split a bill with friends who drank far more than she did). Having kids narrows the pool, too. You’re probably drinking less, lest you wake up to a crying child and a hangover, and you’re also calculating baby-sitting cost. “Our friends used to drink a lot more, and that stopped when kids came along. That’s the biggest driver of cost, and it goes away. Right away, you can shave the bill by a third,” agrees Arlington’s Grant Cook. Cook, a recovering alcoholic, doesn’t drink but gamely throws in a few extra dollars with friends to even out the tab. “Even parents who used to drink tend not to drink. You’re not wiling away a five-course meal around 9 o’clock or getting a reservation at 7:30. You have to pick places where you get in early and get out,” he says. Baby-sitting costs make a night out even more daunting. In the Boston area, rates are $20 per hour or more, sometimes more than the cost of a meal itself. Many couples alternate nights out instead or else accept invites more deliberately than before. “Honestly, we try to think about whether an event will be that much fun anyway. We’re probably missing out compared to our wealthier friends who seem to go out for evenings and dates a lot,” says Milton’s Kait Ziskin Levesque, who alternates nights out with her spouse to avoid child-care costs. Sometimes, hanging out with wealthier pals causes undue stress. “I often have anxiety hanging out with [wealthier friends] because I can’t afford to do what they can. Fortunately, they’re pretty aware and suggest low-cost options, but it can still feel like a bummer,” she says. And if you really can’t afford a meal, don’t force yourself out and then stew in resentment. Instead, invite your group over for dinner and explain the circumstances, says Parnes. “It makes us feel vulnerable when we ‘dare’ to tell them — but, really, it’s a way to show you trust them. They’re not going to think less of you,” Parnes says. Hanson’s Michaela Colón and her husband sometimes do takeout pizza and wings for $22. This is a splurge: She recently stopped working as she prepares for her second child. Usually, the couple shop at Market Basket. She has a standard response when invited out. “I turn it around and try to make other invitations: ‘If you go out, come have drinks at our house after,’ ” she says. Medford’s Jessica Riggs Garton uses the term “economic bandwidth” when declining invitations. Her honesty paid off. Neighborhood restaurants are getting the message. Brookline’s white-tablecloth Lineage is now Prairie Fire, serving pizzas. Cambridge’s T.W. Food and Self-Portrait, both elegant French spots, have given way to Tallula, outfitted with family photos on the walls and the occasional appearance of the new owners’ 17-month-old daughter. In Concord, casual Italian chain Fiorella’s Cucina replaced swanky Bondir. In Newton, the team behind date-night spot Sycamore recently opened Buttonwood, an offshoot with prices and a vibe targeted to families. West Newton’s Lumiere is also shaking off its elegant image in favor of a more low-key approach, says chef-owner Jordan Bailey. Lumiere offers a dinner-and-a-movie deal where customers get free desserts, and $25 weekly wine tastings with four pours of wine and snacks. Restaurants usually have an invisible price limit, beyond which they know customers will balk. Watertown’s Strip T’s straddles the line between casual neighborhood joint at lunch and more experimental meals by night. Chef Peter McKenzie came aboard as chef two months ago, and he sees the tension as he builds the menu. So what’s a cash-strapped diner to do? Don’t lose sight of simple pleasures. Chef Brian Poe — who used to write his menus over $4 draft pitchers at BK’s Bar and Grill on Revere Beach — has mastered the art of perception: At Cambridge’s Bukowski Tavern, he offers $3.95 peanut butter and jelly, $3.95 grilled cheese, and a $9.95 “Hobo special,” which includes a hot-dog and a 40-ounce beer. It’s more than you’d spend at home, of course, but it feels like a compromise if you’re hankering to go out. And, sometimes, wearing your budget on your sleeve can be almost liberating. And, really, sometimes the benefits of an occasional nice night out outweigh financial stress. That said, the couple usually stays out for three or four hours at most. Getting older, it seems, is life’s natural budgeter. Monday: Order $1 tacos at the Automatic (50 Hampshire St., Cambridge) from 4 p.m. until 6 p.m. Feeling anxious over tax season? Ask for an off-menu shot of Old Grand Dad for $3, any time. If you’re on a date, the venerable Mount Vernon Restaurant & Pub (14 Broadway, Somerville) has $23.99 dinner-for-two specials beginning at 3 p.m. that include soup, salad, entrée, veggies, a starch, and dessert. Tuesday: Grab two dumplings for $1 at Banyan Bar + Refuge (553 Tremont St., Boston) from 4 p.m. until 6 p.m. Then head to MET Back Bay (279 Dartmouth St., Boston) for a $6 taco trio (short rib, pork, skirt steak). 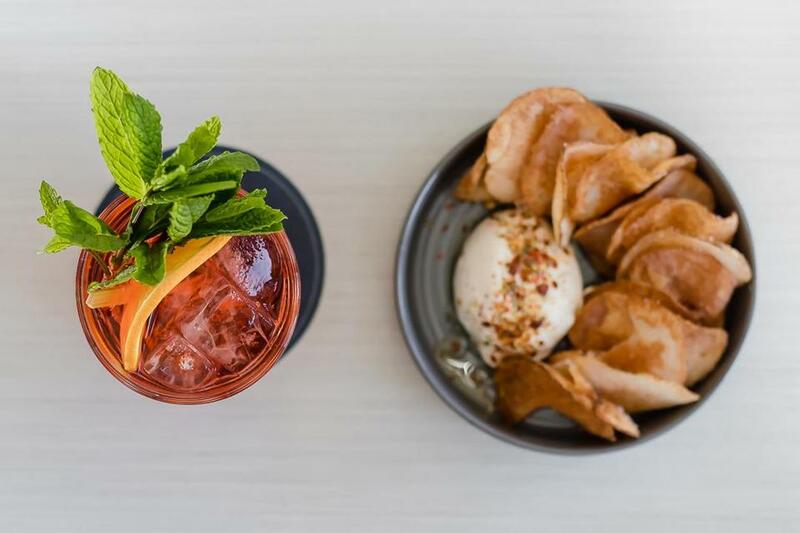 Free off-menu snacks at Bar Mezzana include salt and vinegar chips and dip. Wednesday: Get a free off-menu snack, such as chips and dip, with an $11 spritz at Bar Mezzana (360 Harrison Ave., Boston) from 5 p.m. until 7 p.m. Then visit Joe’s American Bar & Grill in the Back Bay (181 Newbury St., Boston) for $2 tacos from 4 p.m. until 8 p.m. If you’re in the North End, get two cod tacos for $5 after 6 p.m. at il Molo’s bar (326 Commercial St., Boston), by request only. Thursday: Kids eat free at The Kirkland Tap & Trotter (425 Washington St., Somerville) from 5:30 p.m. until 6:30 p.m. Or grab a free cheese or pepperoni bar pizza down the block at Puritan & Company’s bar (1166 Cambridge St., Cambridge) from 9 p.m. until 10 p.m. 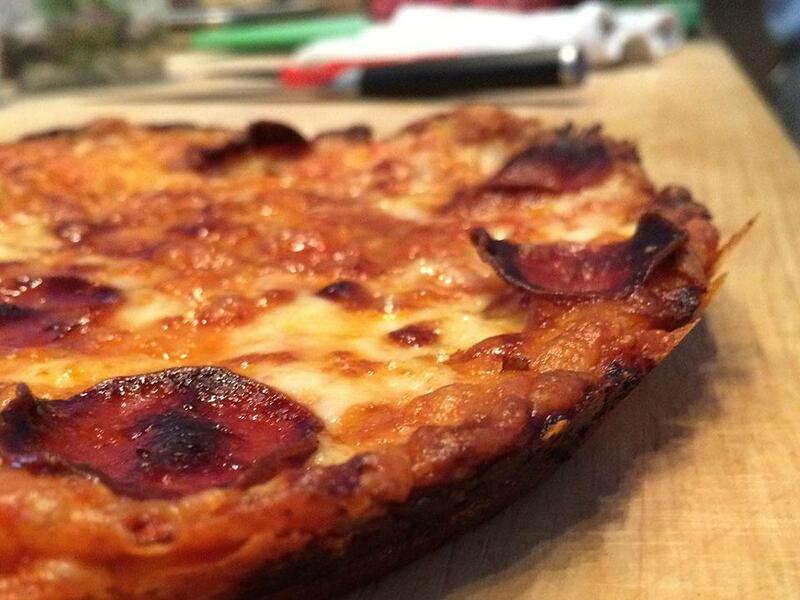 Grab a free cheese or pepperoni bar pizza at Puritan & Company’s bar between 9-10 p.m. Thursday. Friday: Kids get free grilled cheese (clothbound cheddar on brioche, if you please) at Brassica Kitchen & Cafe (3710 Washington St., Jamaica Plain) from 5 p.m. until 6:30 p.m. Or visit Bambara (25 Edwin H. Land Blvd., Cambridge) for half-off bar menu items from 5 p.m. until 7 p.m. If you’re really hungry, dine at Frank’s Steakhouse (2310 Massachusetts Ave., Cambridge) before 6 p.m. for the early-bird special: soup or salad, entrée, potato, rice, and vegetables — plus a sundae — for under $15. Saturday: Visit Grendel’s Den (89 Winthrop St., Cambridge) for half-price food from 5 p.m. until 7:30 p.m. with any $4 drink. Feast on two-for-one fajitas at Olde Magoun’s Saloon (518 Medford St., Somerville). If you’re out late, stumble into Uni at the Eliot Hotel (370A Commonwealth Ave., Boston) for a discounted late-night menu after 10:30 p.m. with snacks such as $6 fried chicken steamed buns, or stop into Eastern Standard (528 Commonwealth Ave., Boston) for the lower-priced chalkboard menu after 12 a.m., where many dishes are $8. Sunday: Present your West Newton Cinema movie stub at Lumiere and get a free dessert (1293 Washington St., Newton); or have a four-course meal at Craigie on Main (853 Main St., Cambridge) for $45 after 9 p.m.